Does the size of your body fundamentally impact how you see the world around you? Are your perceptions inextricably tied to your dimensions? Researchers in Sweden say the answer is yes. Reaching this conclusion was as simple as swapping people into different-sized bodies. Before you get too concerned, let me clarify that the bottommost figure in this photo is not a headless child. 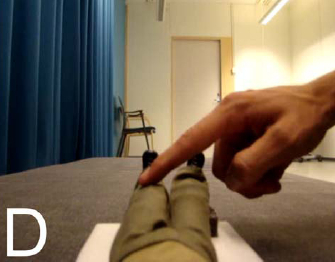 The researchers used a "body-swap illusion" that requires a somewhat tricky setup, as you can see above. The subject (the one with a head, on the left) lies down and puts on a headset. Instead of seeing her own body, when she looks down she sees the images coming from the cameras to her right. The cameras are looking down at a mannequin's body, which can be the same size as the subject's body or not. So far, no illusion: the subject knows this isn't her body. But the experimenter then starts to touch the subject's and mannequin's legs simultaneously and in the same places. After a few minutes of seeing touches on the mannequin's legs and feet that correspond to the touches she feels on her own body, the subject experiences the strange sensation that the mannequin's body is her own. The touches have to happen in the same place and at the same time for the illusion to work. If the experimenter's pokes at the mannequin's and subject's legs are out of sync, the illusion fails. This was the control condition for all the experiments. One of the first versions of this study, back in the late 1990s, involved a rubber hand. Subjects rested one of their hands on a table, but their view of that hand was blocked by a small barrier, while a rubber hand was in full view. The experimenter stroked the backs of both hands with a paintbrush for several minutes, and the subjects eventually came to feel that the rubber hand was their own. Some subjects even reported seeing the hand start to look like their own. As an aside, I have a special affection for this area of research because I actually used the rubber-hand experiment for my eighth-grade science fair project. I had read about the study in Discover magazine and I wrote to the author, Matthew Botvinick, to ask for more information so I could replicate what he'd done. Not having access to whatever supply stores psychology researchers use, I resorted to using a rubber hand from a Halloween shop. It had a gory, sawn-off wrist that my mom covered with an old shirt sleeve of my dad's. We named the hand Larry, and my ten subjects (it's hard to recruit subjects when you're paying in Reese's peanut butter cups) reported satisfyingly eerie results. One friend got freaked out by the illusion and threw poor Larry across the room in the middle of the experiment. I was a big hit at the county science fair, which made up for some of the successes I was obviously not having in other areas, like sports or being cool. Afterward, Larry was relegated to living under my bed, where he occasionally gave me heart attacks when I went searching for things. Since the Swedish researchers wanted to know how the size of your body affects your perceptions, they decided to "swap" their subjects into outlandishly sized bodies. 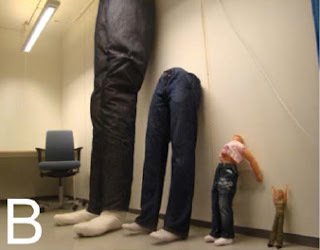 In addition to a normal adult-sized mannequin and a toddler-sized mannequin, they created a giant set of legs that would have fit on a 13-foot-tall person. They also did the experiment with a Barbie doll, which they expected to be an extra challenge because not only is Barbie just under a foot tall, but she's recognizably a toy. Equipped with their cast of Gulliver's Travels characters, the researchers performed a series of experiments. First, they showed that they could make the illusion work even with a giant body or a Barbie body. They conclude that the illusion is "potentially unlimited," which makes me eager for their follow-up study. 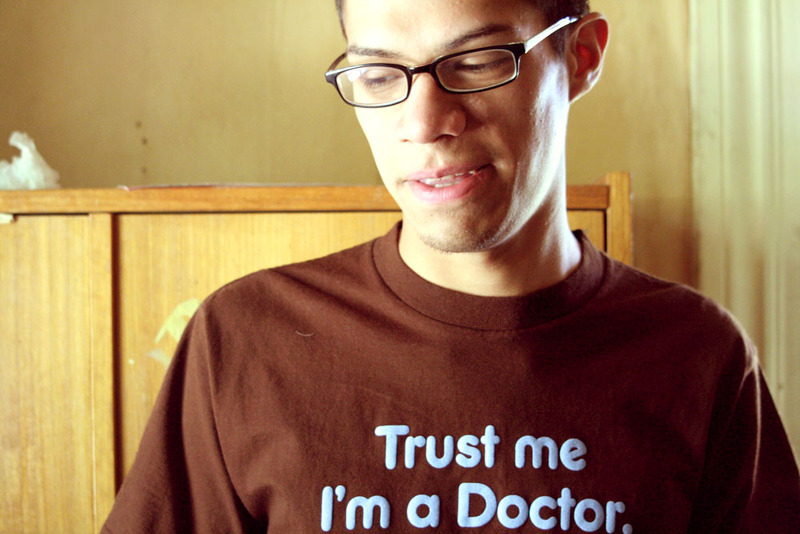 This all seems creepy enough, but it was worse for subjects in the stabbed-in-the-abdomen portion of the study. To prove that subjects were really feeling ownership of the fake body, and not just experiencing a visual illusion, researchers measured subjects' skin conductance (an indicator of high emotions) while sticking a knife into the mannequins' stomachs. Unsurprisingly, subjects were scared by this. But the researchers wanted to test what being in a giant world--or a tiny world, in the case of subjects who had been swapped into giant bodies--really meant. They hung cubes of different sizes in front of subjects who had been body-swapped, and asked them to estimate the objects' sizes. Subjects who were inhabiting a tiny body thought the cubes were huge, just like the giant hand that had been poking them in the legs. Subjects who felt like they were inhabiting a huge body, conversely, thought the cubes were tiny, just like the puny researchers tickling their feet. Control subjects, who were looking at the same set of legs but not experiencing the illusion, didn't misjudge the cubes in the same way. This showed that the subjects weren't just comparing the cubes to the size of their legs--they really felt that everything in their world had grown or shrunk. Finally, the researchers put objects at various distances from the subjects, then asked the subjects to stand up and walk (with their eyes closed) to where they thought the object was. The giant-body subjects thought things were closer to them, while the tiny-body subjects thought everything was farther away. Even when standing and walking--physically inhabiting their real bodies--they were still mentally inhabiting their fake bodies. Aside from creating crazy props to fill some lab's store closet, the study suggests that our sense of our body size is tied to how we perceive the world. (Other studies have shown that your height affects how you experience time.) When we look around us and judge how far away other people are, how tall a building is, or whether we have enough time to dash acros a busy street, our mental calculations rely heavily on the body that our brain is inside. This makes me wonder whether people who have just lost half their body weight due to gastric bypass surgery, or lost both their legs in combat, feel as though they're inhabiting an entirely new world. The authors suggest a few fascinating applications for their research in the field of virtual-reality-meets-robotics. Perhaps surgeons who need to perform a microscopic procedure could be made to feel as though they're inhabiting a very tiny surgical robot. Or an engineer could inhabit a gigantic oil-drilling robot at the bottom of the sea. They'd have to watch out for enormous squid, though, because those things are not an illusion.